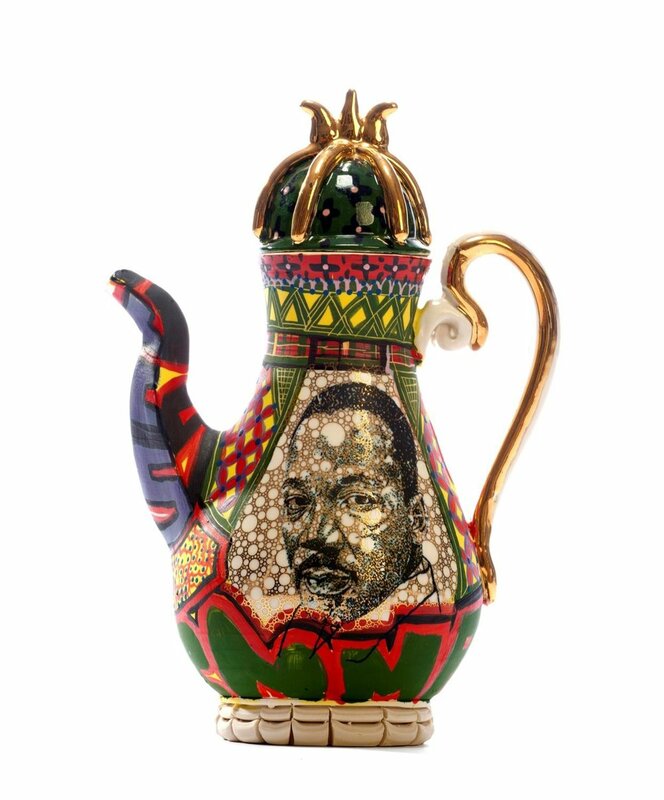 …an American potter, social activist, spoken word poet, and educator. He’s worked with TGIAL’s Vital New Voices initiative in New Haven…and his artistic and social philosophies are on-the-ground reflections of the program’s core values. Roberto introduces himself in the short video to the left. He delved into detail about his work and philosophy in a recent interview with TGIAL Board Member Howard Margules. Here’s the transcript. It’s a really great honor to meet you. Maybe we should start off with just briefly stating what the Global Institute for Arts and Leadership is about. To make it very short in one sentence: we believe art can create a positive change. The Vital New Voices program is a new one and we’re very happy to have you involved in it. So I’d like to ask you, Roberto: tell us a little bit about your background and maybe a little bit about how what you do fits in with what we do. I’m from Philadelphia and I come from a part of the city that’s—it was the early eighties so it was around the time of the crack epidemic, and I grew up in a pretty impoverished neighborhood. The exposure that I had to art early on was through the Philadelphia murals. As a teenager I began to participate in graffiti, more as a social practice to fit in with others. I didn’t really see it as an art form, but what I did notice is sometimes there would be parts of the city where there was graffiti and the city would cover it up. But there was still garbage, there were still used syringes, there was still all this residue of poverty on that neighborhood. They wouldn’t take those things away but they would cover the graffiti up. Years later what it made me think of is how important that was, those voices. And so I realized at a young age how important a voice is and how what we view can really impact a community, because art really has a capacity to create empathy in people in a way words often can’t, because sometimes words trigger certain feelings and ideologies from people whereas art has the capacity to get beyond all the politics and just get to the heart of the person. That’s one of the reasons why I work in art and why I work with kids, because I feel like having the opportunity to be able to communicate and articulate who they are and what they’re about is so important to their growth as people. How does what you do fit in with the Vital New Voices project? Going through the process of going to school for the visual arts what I’ve realized is that there’re very few folks [of color] that come through undergraduate school working in the visual arts and even fewer of those people who wind up teaching and being educators. When [young artists of color] come into contact with people of color in positions of power, and they can see themselves reflected in their teachers, they can see themselves being there too and for me that’s important because I feel like in order for us to really be able to do something effective with art you have to be able to exhibit confidence, so the more diverse voices we have within that discourse the more likely it’ll be to achieve that. In my particular case I’m working toward creating more and more opportunities for young artists of color. It doesn’t end at that but that’s something I’m aware of and something I’m trying to work toward. That’s an essential part of what I want to do. I’d be interested in hearing what kinds of themes came out of the project this summer. How would you say the participants voices were heard and how did they extend those voices to engaging in social change? What would you say has been the biggest impact on your students? I’d imagine you’d get a much more articulate answer from them, but from the responses that I’ve heard so far it’s been one another and being able to interact with people that they wouldn’t normally be able to in their normal settings, so for example we have some students that really vary in terms of their socio-economic backgrounds. [The group] is really diverse not just racially but also in terms of gender identity and other issues of representation. I think for students who normally aren’t around let’s say black students or aren’t normally around a lot of students that are questioning their gender has really allowed them to build compassion for other people. It’s really relatable to what happens also outside the visual arts and whats so profound about the arts is that it really frees [the students] from having to follow a formulaic approach to those conversations and really have the autonomy to take it wherever they want. Do you see an impact on the greater community? Yes certainly. With our students here one of things we’re working towards is teaching them processes and technical skills that they can then use to work with outside of the classroom, and we’re hoping these are skills the students will be able to bring outside of the program. One of the other things that’s coming about that is that the students are expanding their idea of what an artist does. I think a lot of times people think an artist is one of two things; they’re either living from their work or they can become teachers, but I think multiple students are probably thinking now that they can be artists as long as they keep making their work and doing what’s important to them. I think in so many ways a lot of the students are seeing that now, and they’re realizing that it’s important to physically go out and work. We’ve taken several field trips there’s this community workshop and I think that’s really going to be a good force for that. If you were going to say the students all spoke with a voice or many voices, what do you think all the voices would be shouting? One of the things the students have expressed is this feeling that leaving here will be different. They were coming in here as one person and I feel they’re leaving here with a different perspective on things, whether that’s how they interact with people or their decision for their career or artistry. I think this has made [these questions] more complicated for our students and I think that’s really good. I think a lot of times people have an idea about what they are doing; they think for example, “I want to be a veterinarian,” and they’re working towards that, and they never pause and think, “is this really what I wanted to do?” Through this process we’ve complicated those thoughts and we’ve given the students the responsibility to question them. It was wonderful being able to participate in this project with you at the Global Institute for Arts and Leadership and we’re really thrilled to have this opportunity. It just sounds like you moved the ball forward with the students in a short period of time and I thank you very much. Thank you guys for the support. I can’t tell you how important this work is. You can see it already in the response that were getting from the students, that they are really looking forward to going out into this world and figuring out and continuing the type of work that they are doing.